Specimen kindly loaned by Dr.Martin Luff A local and rare species with most records from northern England (Pennines) and the eastern Highlands (Grampians) although there are records from the Western Isles and a single record from Shetland. The most southerly modern records are from above the Humber estuary and north of Manchester, and there are older records from East Anglia and Wales (Luff, 1998). Lindroth (1974) includes Hampshire but this is not given elsewhere. Occurs on open, dry soils including spoil heaps from mines from June to October (Luff ibid). Expecting the species from Watford is optimistic. 4-5.5mm (Lindroth). Narrow and elongate in appearance, upper surface flat when compared with N.aquaticus, view from side. 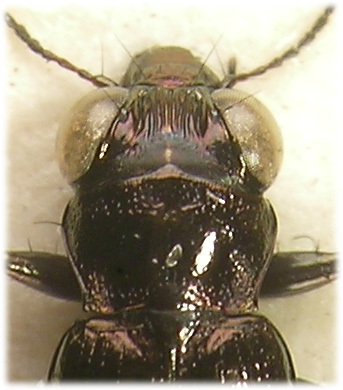 Entirely dark and very shiny with a reddish bronze reflection, vaguely blue at base of head. Head as wide as, or very slightly wider than, pronotum, with a single long seta beside eyes and either side towards base of clypeus. With six parallel ridges between deep longitudinal furrows near eyes, lateral ridges extend slightly further back. Clypeus extensively wrinkled. Labrum microgranulate and strongly metallic, front edge smoothe and shining. Base of head microgranulate, very finely punctured and transversely wrinkled laterally. Antennae entirely dark or with segments 2 and 3 vaguely lighter. Pronotum weakly rounded anteriorly and strongly bordered, sides almost straight and contracted to base, basal fovea deep and extensive. Puncturation around edges mostly discreet, along front margin separated by about twice the diameter, closer laterally where the cuticle is wrinkled (X40) and so appears less shining. 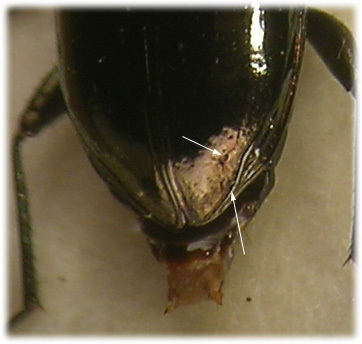 Scutellum granulate, concolorous with elytra. 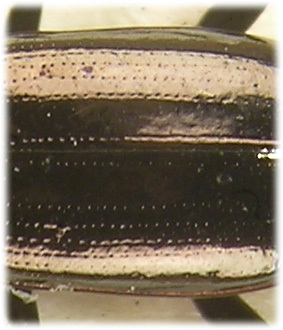 Elytra without pale apical marks but maybe rufinistic (Luff, 2007), striae finely punctured and evanescent towards apex. Second interstice about as wide as 3 and 4 combined, all interstices shining, without microsculpture (X20) except for a strongly granulate area before apex. Viewed at low power (X15) the elytra are vaguely wrinkled, especially interstice 3-7. With two strong punctures lying between two raised ridges before apex and a further two above these ridges. Fourth interstice with asingle strong puncture before middle. 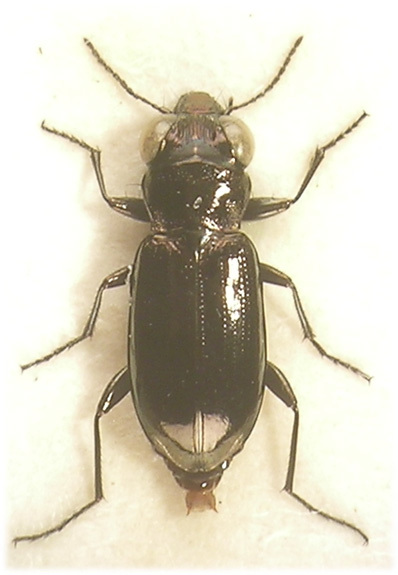 Legs entirely black, in our specimen all legs are metallic black without any pale areas.